Multi LED indicator: 3LEDs indicate 20% 80% 100% charged , battery reverse hook-up protection, built-in temperature compensation circuitry. With microprocessor controlled – 7 stage charging program, multi-stage charging for added precision, safety and battery life. Capable of recharging severely discharged or heavily sulfated battery with a desulfation function, extend the life of your battery. Temperature self-compensation: Charging voltage adapts to temperature to prevent over or under battery charging. Capable of recharging severely discharged or heavily sulfated battery with a desulfation function, extend the life of your battery. 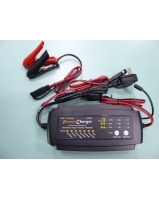 Charger for GEL, Flooded(WED), AGM, Calcium type deep cycle, VRLA, maintenance free Lead-acid batteries, other battery types may burst causing personal injury and damage. Fully Automatic – faster, safer, smarter. Monitors the battery and resumes continuous charging when the battery becomes discharged.